360 Total Security is a popular and free security and/or system optimization software developed by Qihoo 360, an IT company based in China. In addition to ability to scan, detect and remove computer viruses, malware, and trojan horses using 360 Cloud Scan Engine, System Repair Engine, QVM Ⅱ AI Engine, Avira Engine and BitDefender engine, 360 Total Security also comes with a feature called 360 Sandbox. 360 Sandbox is essentially providing a security mechanism for running programs on a separate, isolated and quarantined virtual space environment. It’s especially useful for running unverified or untrusted applications as sandbox prevents any changes to the host system, minimizing risk and keeping potential threats and harm from the PC. After installing 360 Total Security that comes with 360 Sandbox, a right click contextual menu for files and folders has an additional entry, namely Run in 360 Sandbox. In order to housekeep and reduce the bloatness of right click contextual menu, and you want to remove and hide the “Run in 360 Sandbox” item, especially when you’re not using the sandbox. If so, the program has an option to easily turn if off. 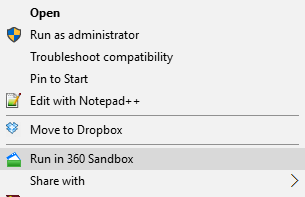 To remove the “Run in 360 Sandbox” on the right click contextual menu, open the 360 Total Security program, then open the Sandbox window from the left pane. Go to Advanced Settings, and deselect the Add “Run in sandbox” to context menu option under “Notification” section, and the entry will be removed from right click menu instantaneously.